And since it’s Valentines day, I guess it’s apt to talk about Pag-IBIG. What is the status of your Pag-IBIG? But just as you think this is all about matters of the heart, you are wrong, because when I say Pag-IBIG, I mean “Pagtutulungan sa Kinabukasan, Ikaw, Bangko, Industria at Gobyerno”. It’s a savings scheme that harnesses these four sectors of our society. 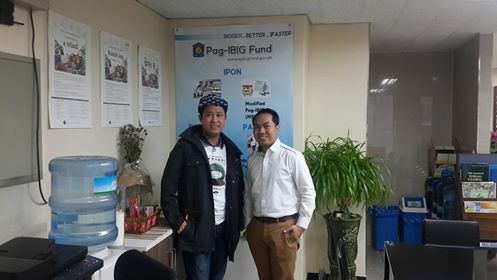 After a failed attempt to attend the lecture of Mr. Dominic A. Leoligao, the service officer of Pag-IBIG in South Korea, during a seminar at the Embassy of the Philippines in Seoul , I cornered him in his office to ask questions regarding the Pag-IBIG. I think I lost my account already because I never contributed since I arrived here in Korea because 1.) I don’t know how to pay for my monthly contributions. 2.) I completely forgot about it. The good news is, if you have already contributed before and you stopped contributing for quite sometimes, your money is still there. All you need to do is check it on your online account or you can visit Mr Leoligao at the Philippine Embassy in Seoul to check your previous contributions and the dividends it earned. 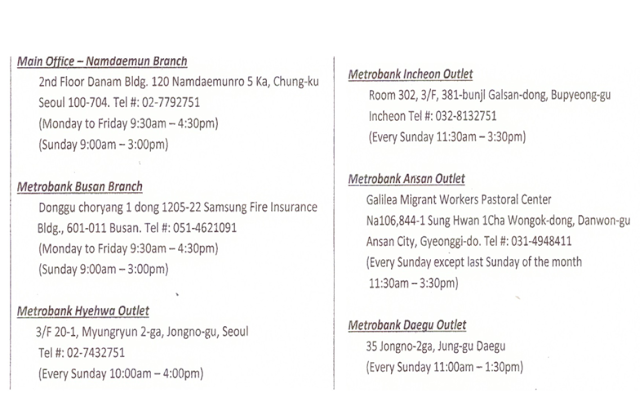 If you are here in Korea and you wish to continue your contribution to your Pag-IBIG account, you can deposit it in the following Metrobank branches all over South Korea. You need to present your Pag-IBIG ID number when you pay, but if you don’t know about it, you can ask sir Dominic for assistance. Why would you even bother contribute to your Pag-IBIG? Now, investment opportunity in Pag-IBIG doesn’t end just like that. 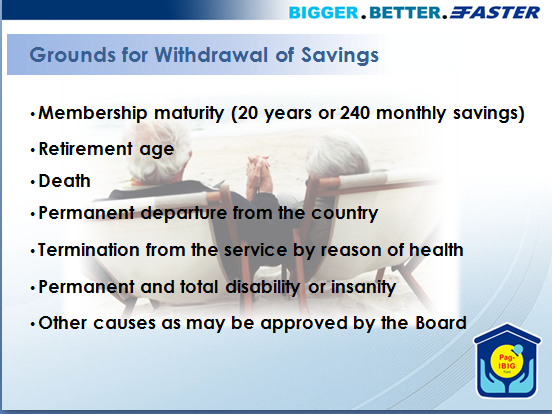 As time goes by, it develops a new saving scheme that would benefit active contributors, and by active I mean those who were able to pay at least the latest 1 year contribution. 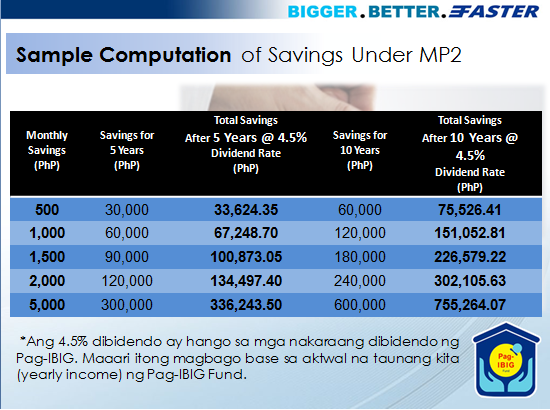 This scheme is called MP2 or Modified Pag-IBIG 2. 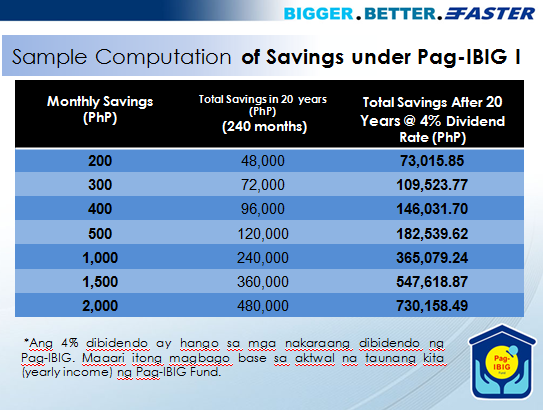 Technically, it’s the same as the usual savings program of Pag-IBIG except that the monthly contribution is slightly higher and the dividend is 4.5 percent rate. With a minimum contribution of 500 pesos per month, in the term of 5 years, you can get a lump sum of your contributions including the dividend, no need to wait for retirement or several months. Here is a sample computation of savings under MP2. So you see, Pag-IBIG is a good saving scheme. It’s just like putting your money in the bank but with higher yield of interest and better return. The only setback for this is, there are terms that you must follow to get your money back. It’s not like in a bank where you can easily withdraw your money. But then again, Diversification is the keyword. If you are one person who wants to put your eggs in different baskets, Pag-IBIG is definitely one nice basket to entrust some of your eggs. If you have questions, shoot Mr. Dominic Leoligao a private message on Facebook, or better yet, visit him in his office at the Philippine Embassy in Seoul. You can also call him at 01071450385 or email at duwarf2007@yahoo.com.ph. Sir Mam member po ako ng pagibig non pa hnd na ako nakapaghulog.pd po ba na mahulugan yong pagibig ko or hnd pa kaya cancelled na..
Hi po..im here in korea..just waan ask po pano ang apply ng pag ibig thru phonw..urgent lang po nees po lasi sya to open a bank acct.